The Paradise Cookery School is officially open! Stepping in for a celebrity chef, Millie Harper is feeling the pressure to make the first ever Paradise Cookery School classes a dazzling success and ensure that bride-to-be Imogen and friends have an unforgettable experience. Meanwhile, Millie is trying to play it cool around handsome estate manager Zach Barker. But whenever he is near Millie cannot fail to notice the chemistry between them – until someone from Zach’s past arrives and any potential romance seems out of the question. 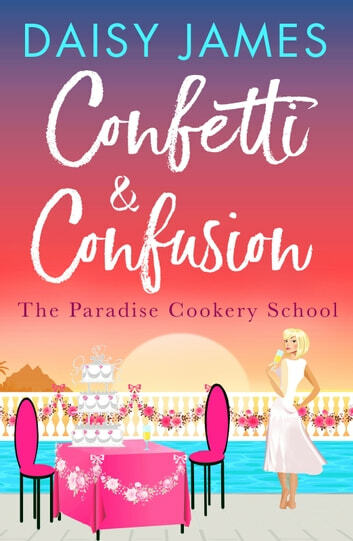 When disaster strikes and the wedding is in jeopardy, Millie realises she may have to go above and beyond to make sure the school is a success. Can Millie manage to create a day that dreams are made of, and will she find a way to tell Zach how she feels? Once again we travel to the gorgeous Caribbean island of St Lucia and join Millie Harper and the Paradise Cookery School. This book is the second in a series, the first being ‘Sunshine and Secrets‘ which was reviewed by myself back in March 2018. Millie is standing in for celebrity chef Claudia and running the cookery school. She was initially asked to come to the island to help oversee the work on the new school, but with Claudia still unavailable it is up to Millie and chef and friend Elle to run the place. Their first customers are there for a week’s worth of baking and tasting as part of a hen party. Imogen is the bride-to-be and is enjoying learning how to make glorious chocolate recipes. her mum, however, isn’t quite so keen, she is also a bit full on when it comes to the wedding arrangements. The cookery school was booked to give the party a relaxing time but it would seem the party is in for one mishap after another. St Lucia sounds so divine and this book makes me want to visit it, not only for the sights but the delicious smells that this book seems to input into your brain whilst you are reading. I enjoyed catching up with Millie and seeing how she would cope with running the school. She might be a dab hand in the kitchen – she is a Michelin Star Chef after all, but speaking in front of people and teaching is not her forte. The book has plenty of laugh-out-loud scenes and was a real joy to read. Millie was the saviour of the book, over and over again. It was quite amusing being witness to some of the disasters, although I’m sure I wouldn’t be laughing quite as much if they were happening to me. Whilst I believe it would be best to start with the first book in the series, I couldn’t really see anything in this one that would make it difficult to understand what was going on if you read this as a stand-alone. It is a quick read at only 160 pages, but the book is filled to the brim with delightful characters and a plot worth investing your time in.